Home » Get fussed with Fibre! Public Health England recommends that adults in the UK consume 30g of dietary fibre per day, however the British Nutrition Foundation has found that most adults only consume 18g. We’ve joined forces with Arla Fibre to show you how easy it is to bridge the 12g ‘fibre gap’. 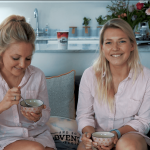 Many people tell us they are put off thinking about fibre because it’s normally found in brown or boring foods, but that doesn’t have to be the case at all! You can make simple small swaps throughout your day to rack up that fibre content quicker than you can say the word itself! Most nuts are a source of fibre; however, some nuts are higher in fibre than others. For example, Almonds boast a higher fibre content because they are served husk still on, compared to their naked neighbour, the cashew. A simple way of knowing exactly what is in your food is to cook from scratch. We know not everyone has the luxury or time to do this but if you can, do. Making your mash and leaving the skin on will give you great texture and will help towards hitting that magical 30g of fibre number. For example, just 200g of mashed sweet potato with the skin on provides 6.6g of fibre. Switch out your current fruit yoghurt for 150g of Arla Fibre. Just one portion offers up 4.6g of fibre. The chicory inulin in Arla Fibre adds no texture or flavour to the yoghurt, just a simple boost of fibre. You can enjoy your Arla Fibre in 5 delicious flavours; plain and natural or strawberry, raspberry, mango & passionfruit, and blueberry. We should all be adding more to our diet but there are some fruits and veggies better than others to help us hit out 30g fibre intake. If you swapped out a portion of grapes and tomatoes for strawberries and green beans you would be adding a whopping 4.5g of fibre to your day. Simple swaps, make for big steps! Not all carbs sit equal. The more refined the carbohydrate the less fibre it contains, that is. Your mother hasn’t been telling you to switch from white to wholemeal for no reason, there is method in her madness! Suggestions for swaps could be switching up your white rice for a wholemeal option. You could even take it a step further and try and swap white bread to wholemeal bread and the same with pasta. 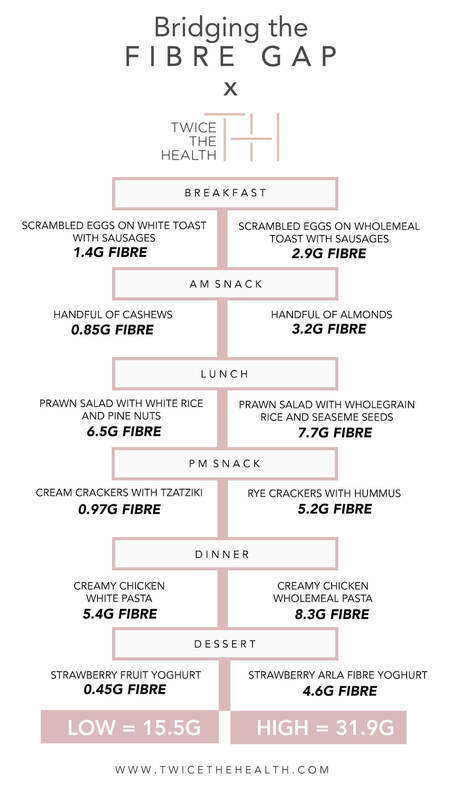 We hope you now can see how achievable (and easy) it is to hit your fibre goal of 30g without having to change up your entire menu, and day to day diet!